A “garage sale” on a massive scale that benefits the environment, community organizations and countless satisfied shoppers, the 17th annual Clean Sweep takes place 8 a.m.-4 p.m. Saturday, June 17, at Bates College’s Underhill Arena, 145 Russell St.
For more information, please contact Pat Pelliccia at the Auburn SHARECenter, 207-344-8485. As students pack up to leave Bates at the end of the school year, they donate to Clean Sweep all kinds of possessions still in good condition: clothing, electronics and toys, household goods and small furnishings, bikes and books, sporting goods and more. Volunteers from nonprofit social service agencies in Lewiston-Auburn organize the merchandise and staff the sale. In turn, all proceeds from Clean Sweep are divided among the participating nonprofits — six of them this year. In addition, he says, “this models good behavior for our students and shows them that there are alternatives to just throwing things out. 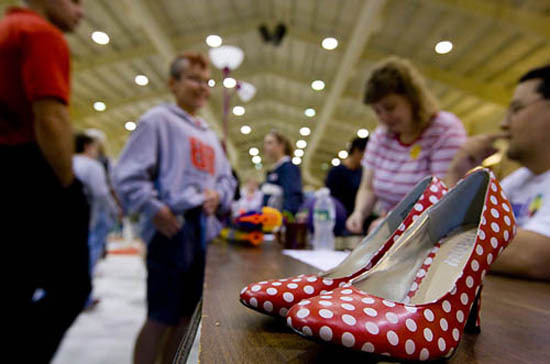 There’s also the community benefit of having a big yard sale,” as shoppers find treasures at bargain prices. Bates is one of a number of colleges and universities nationwide that hold such sales. and Tri-County Mental Health Services’ Social Learning Center, Lewiston. Held at the Lewiston Memorial Armory last year, Clean Sweep is back on the Bates campus for 2017.